Tioga Pass in Yosemite is, I understand, the highest point on any major highway in California. I was a little apprehensive about the trip, and even delayed it from Sunday to Monday to avoid the weekend crowds. 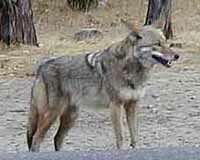 Then Sunday afternoon I met an RVer who had just come through the pass East to West. He called it his scariest driving day ever, with narrow winding roads, steep hills, and dangerous drop offs, and advised me to avoid Tioga and take another route across the Sierra. Then we started talking about solar panels and other RV equipment and somehow started talking about tires. The tires on my trailer have, I believe, about 14,000 miles on them and, from visual inspections, look to be in great shape. The spare tire has never been used and looks brand new. But when this guy found out that they were 10 years old, he advised me to go immediately to a tire store and have them replaced. He gave me graphic descriptions of serious damage that can result from the sudden failure of an old tire. He told of other people with old tires who had ignored his advice to change them immediately and had soon suffered multiple tire failures with serious damage to their rigs. I was getting pretty scared. 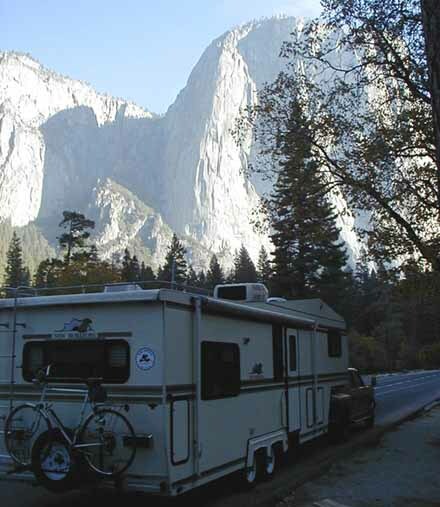 I checked my library of RV books for tire life info, and could not find anything written about the normal lifetime of a tire. I took my RV safety video into the clubhouse to watch the section on tire safety. Another guy came by and watched the video with me, then added his two cents worth Maybe I should think about replacing the tires, but Tioga Pass would not put any particular strain on them. And Yosemite is hilly but it's no sweat. 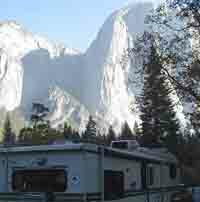 The guy who said Yosemite was hell was pulling a 35 foot trailer. The guy who said "no sweat" was pulling a 28 foot trailer. Mine is 30 feet. I decided to go for it! I would start as early as possible to give myself plenty of time. The trip through Yosemite went without any problems. Traffic was light so I could usually go at a comfortably slow speed without blocking anyone. For the most part I went uphill in 2nd gear at 30MPH, downhill in 2nd gear at 35MPH, and down the 8% grade from Tioga Pass in 1st gear at 25MPH. I rarely needed to use my brakes (except when I stopped in a pullout to let traffic pass me). 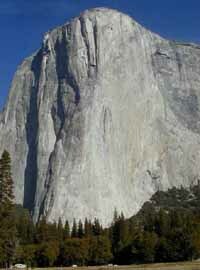 I didn't stop to hike, so all I saw of Yosemite I saw at pullouts or through the windshield. And what I saw, with morning sun shining on it, was beautiful. I'm now parked at June Lake on the eastern side of the Sierra at an elevation around 8,000 feet, in an almost deserted campground. At 630PM the temperature has dropped into the 40s, the coldest weather I've seen for a while. Tomorrow I go to the ranger station in Bishop for information on climbing conditions, then get as close as I can to Boundary Peak, NV so that I will be in position to climb it on Wednesday. And in a few days when I get near Las Vegas, I will probably stop at a tire store and ask some questions. 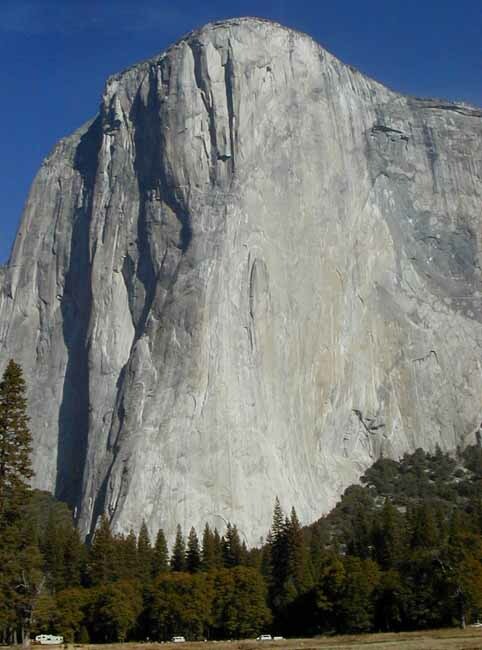 El Capitan, Yosemite. That's my rig in the lower left. 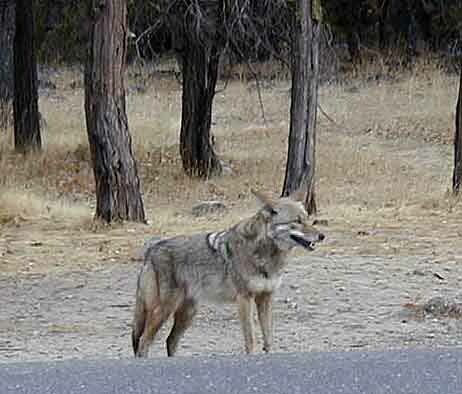 This fellow (Coyote, I believe) seemed to be looking for a handout in Yosemite Valley.